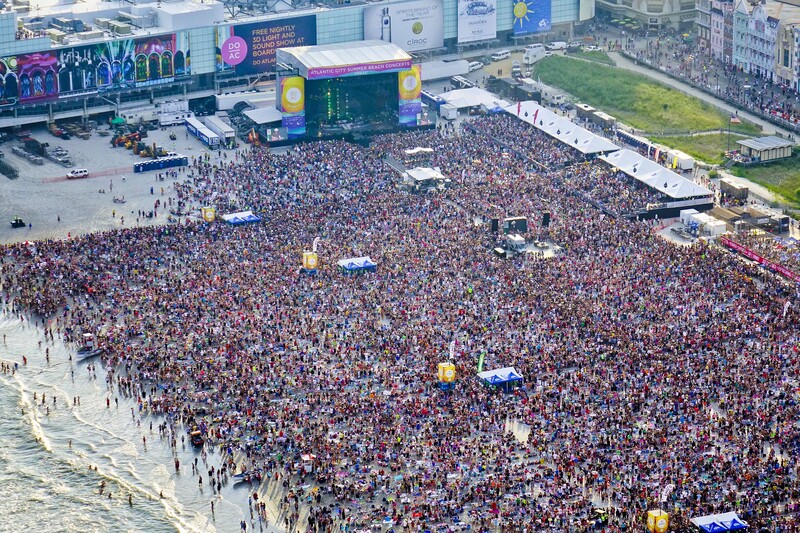 ATLANTIC CITY, N.J., July 31, 2014 /PRNewswire/ -- When Blake Shelton took the stage at 6 p.m. today for his free concert on the free beach in Atlantic City he was greeted by a packed house of 65,000 adoring fans. And that's only within the concert venue! Thousands more anchored boats in the ocean nearby, attended rooftop viewing parties at the casinos and packed the Boardwalk and beach bars hoping to catch a glimpse of the superstar. The weather was perfect, the Boardwalk was bustling and the beach was sparkling and gorgeous. 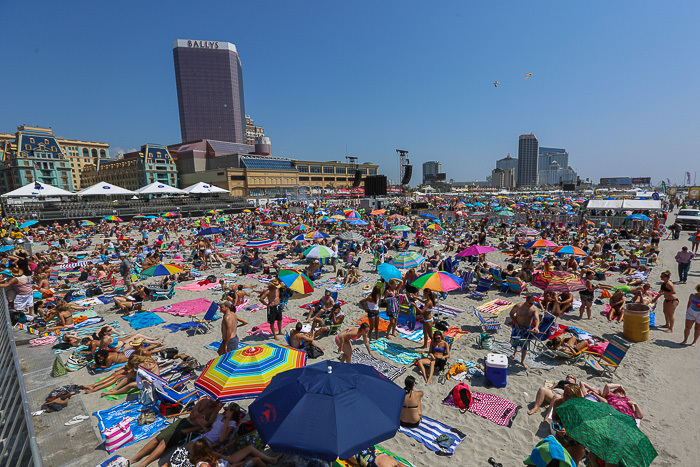 Tens of thousands of happy people enjoyed spending the day on Atlantic City's clean, wide beach and iconic Boardwalk. In addition to the concert, hotels were sold out and the city was jammed with entertainment, events and summer vacation-goers. Opening for Blake Shelton, Dan & Shay got the party started at 4 p.m. The Nashville country-music duo is touring with Shelton on the current leg of his 2014 Ten Times Crazier Tour, which kicked off in June. This unforgettable day at the beach was produced by Atlantic City Alliance, Live Nation and DO AC as part of summer-long musical DO AC celebration of Atlantic City's world-famous Boardwalk and free beach that includes hundreds of free shows and entertainment daily through Labor Day, in addition to several festivals and mega-events, including the return of the Atlantic City Air Show. The incredible weekend concert experience isn't over yet; Lady Antebellum performs on Sunday, August 3 at 6 p.m. with opening act Alex and Sierra, winners of "X-Factor" and behind the hit song "Scarecrow" kicking things off at 4 p.m.
From sandals to stilettos and foie gras to funnel cakes, Atlantic City offers something for everyone. Enjoy world-class entertainment, dining, shopping, gaming, relaxing on the beach and strolling the historic Boardwalk in the city created to escape the city. For more information visit www.doatlanticcity.com. For destination photos and videos please visit www.doatlanticcity.com/mediaonline where dozens of new assets are available for download. Real Estate Channel is now offering a game-changing 3D scanning technology that is set to change the way real estate is marketed and sold. VANCOUVER, July 31, 2014 /CNW/ - Working directly with a Y Combinator Silicon Valley start-up, Real Estate Channel has adopted the state of the art technology that creates immersive experiences of interior spaces using a 3D scanner and proprietary software. In addition, Real Estate Channel now offers HD photography and video service accessible & affordable for industry professionals. COLUMBIA, Tenn., July 31, 2014 /PRNewswire/ -- Charter Communications (NASDAQ: CHTR) customers in Tennessee and Louisiana will enjoy access to more than 200 high definition (HD) channels, better picture quality and significantly faster Internet speeds as Charter completes its move to a 100 percent all-digital network throughout 2014. "By removing outdated analog signals, we regain bandwidth in our network enabling us to provide more HD channels and open the door to faster Internet speeds and future innovation," said Charter President and CEO Tom Rutledge. "This upgrade speaks to the fact that Charter is providing our customers with the very best products at the very best value, and we've invested more than $2 billion in our fiber-rich network to make that happen." Charter is making it easy for customers to receive one or more digital boxes at no cost for one, two or five years, depending on the customer's programming package and other qualifying factors. Customers can obtain these digital boxes through direct shipment to their home by calling 1-888-438-2427 to request a self-installation kit, or pick up equipment at a nearby Charter store. NEW YORK, July 31, 2014 /PRNewswire/ -- If a bear tweets out an update in the woods, does it really count as social media? These and other questions are just some of the topics InformationWeek Radio plans to discuss with a special guest from the US Fish and Wildlife Service. Join InformationWeek editor Curtis Franklin and Dan Ashe, the director of USFWS, as they explore the ways that social media, including Facebook and Twitter, are changing the way the agency works with the public and how the public looks at nature through the lens of social media. This wild and woolly special edition of InformationWeek Radio takes place on Friday, August 1, at 3:00 p.m. EDT (Noon PDT). For a special preview of the show and to learn to more about social media and USFWS, click here to read Franklin's blog post. In many ways, the lessons of the USFWS using social media to better educate the public can be translated into how businesses can better connect with their customers using many of the same best-practices. If you're in charge of your company's social media outreach, this is a show for you. In addition to the live interview, listeners can ask questions and leave comments in the chat room. Please join InformationWeek Radio this Friday and get a better handle on social media. OTTAWA and GATINEAU, QC, July 31, 2014 /CNW/ - The Canadian Radio-television and Telecommunications Commission (CRTC) today announced that it is prohibiting exclusivity provisions in roaming agreements between Canadian wireless service providers to further enhance sustainable competition in the wireless market. In December 2013, the CRTC initiated a formal public proceeding to examine whether certain wireless service providers were subjecting smaller Canadian competitors to unjustly discriminatory roaming rates, terms and conditions. The CRTC has found clear instances of unjust discrimination by Rogers Communications Partnership (Rogers). Rogers has imposed exclusivity clauses in roaming agreements that prohibited smaller service providers from using networks from any other carrier. Additionally, they charged some new Canadian service providers significantly higher roaming rates compared to rates for other wireless service providers. The CRTC is also currently looking at the competitive state of the wireless market and will hold a public hearing on this issue on September 29, 2014. "Competition in the wireless industry benefits society and the economy by providing innovative communications services at reasonable prices. But that is only the case when true and sustainable competition is at play. Today's decision will help promote fairness and a better consumer experience with wireless for Canadians." CONTACT: Follow us on Twitter: @CRTCeng, Media relations: Tel. : 819-997-9403; Fax: 819-997-4245; General inquiries: Tel. : 819-997-0313, TDD: 819-994-0423; Fax: 819-994-0218, Toll-free No. : 1-877-249-CRTC (2782), TDD - Toll-free No. : 1-877-909-CRTC (2782); Ask a question or make a complaint; These documents are available in alternative format upon request. NEW YORK, July 31, 2014 /PRNewswire/ -- SiriusXM announced today that it will broadcast live performances and interviews from the annual Lollapalooza Festival in Chicago as SiriusXM's Alt Nation channel becomes SiriusXM's Lollapalooza Channel. The broadcast will showcase a diverse line-up featuring performances from Lorde, Arctic Monkeys, Fitz & The Tantrums, Grouplove, Kings of Leon, Chvrches, Childish Gambino, Martin Garrix, Jenny Lewis, Bleachers, Interpol and many more. "SiriusXM is committed to providing its subscribers special access to the world's biggest music festivals," said Steve Blatter, Senior Vice President and General Manager, Music Programming, SiriusXM. "We are thrilled to bring performances from this year's amazing Lollapalooza line-up to satellite radio listeners across all of North America." SiriusXM's Lollapalooza Channel will air on channel 36 beginning Friday, August 1 at 6:00 pm ET through Sunday, August 3. Select performances will also air on SiriusXMU, The Spectrum, BPM, Hip-Hop Nation and through the SiriusXM Internet Radio App on smartphones and other connected devices, as well as online at siriusxm.com. Additionally, live video of performances from Lollapalooza will be streaming on SiriusXM's website at www.siriusxm.com/lolla. For more details about broadcast times go to www.siriusxm.com/lolla. For more information on the Lollapalooza Music Festival, please visit www.lollapalooza.com. Sirius XM Holdings Inc. (NASDAQ: SIRI) is the world's largest radio broadcaster measured by revenue and has more than 26.3 million subscribers. SiriusXM creates and broadcasts commercial-free music; premier sports talk and live events; comedy; news; exclusive talk and entertainment; and the most comprehensive Latin music, sports and talk programming in radio. SiriusXM is available in vehicles from every major car company in the U.S. and from retailers nationwide as well as at shop.siriusxm.com. SiriusXM programming is available through the SiriusXM Internet Radio App for smartphones and other connected devices as well as online at siriusxm.com. SiriusXM also provides premium traffic, weather, data and information services for subscribers in cars, trucks, RVs, boats and aircraft through SiriusXM Traffic(TM), SiriusXM Travel Link, NavTraffic®, NavWeather(TM), SiriusXM Aviation, SiriusXM Marine(TM), Sirius Marine Weather, XMWX Aviation(TM), and XMWX Marine(TM). SiriusXM holds a minority interest in SiriusXM Canada which has more than 2 million subscribers. IRVINE, Calif., July 31, 2014 /PRNewswire/ -- Kelley Blue Book www.kbb.com, the only vehicle valuation and information source trusted and replied upon by both consumers and the automotive industry, today announces the installation of a ReadyCam® on-site studio at its Irvine, Calif. headquarters, offering global media outlets immediate and easy access to its analysts and executives. "Kelley Blue Book's new in-house studio provides the opportunity to bring the company's trusted automotive expertise and information to news programs and television stations worldwide," said Chintan Talati, senior director of public relations for Kelley Blue Book. "By having state-of-the-art studio capabilities on-site in our office, Kelley Blue Book will be available to share its valuable market insights and nearly 90 years of auto industry experience any time a broadcast or cable network needs an automotive expert." The ReadyCam studio is an all-inclusive video studio designed to capture, record and transmit HD video and audio over the Internet to anywhere around the world, using VideoLink's EnhancedIP(TM) network. The studio simplifies the production of live, pre-taped and on-demand video content. Visit www.vlguru.com for a list of Kelley Blue Book experts available at this ReadyCam location, and contact a member of the Kelley Blue Book Public Relations team to book an expert. Founded in 1926, Kelley Blue Book, The Trusted Resource®, is the only vehicle valuation and information source trusted and relied upon by both consumers and the automotive industry. Each week the company provides the most market-reflective values in the industry on its top-rated website KBB.com, including its famous Blue Book® Trade-In and Suggested Retail Values, and Fair Purchase Price, which reports what others are paying for new cars this week. The company also provides vehicle pricing and values through various products and services available to car dealers, auto manufacturers, finance and insurance companies, and governmental agencies. Kelley Blue Book's KBB.com ranked highest in its category for brand equity by the 2014 Harris Poll EquiTrend® study and has been named Online Auto Shopping Brand of the Year for three consecutive years. Kelley Blue Book Co., Inc. is a Cox Automotive company. VideoLink LLC is a leading video services provider with experience in all things video from video strategy to production to distribution. Twenty five years of experience in live TV and deep expertise in video strategy and production, VideoLink offers clients a full range of service offerings for any video project. Whether live TV and live video webcasts, or studio video productions, we partner with clients to find creative ways to use video wisely and to deliver video our clients expect. Our clients range from global blue chip companies to million dollar boutique professional services firms who use video for competitive advantage and increase client engagement. VideoLink is a trusted video of partner of TV and cable networks, corporations and institutions worldwide. To learn more about VideoLink services and products, visit us at videolink.tv, follow us @videolinkllc and subscribe to our blog. SCOTTSDALE, Ariz., July 31, 2014 /PRNewswire/ -- Something cool and blue is lurking upon us this summer...but it doesn't bite...it's Cold Stone Creamery SHARK WEEK Creations((TM)), specially created for television's longest running must-see summer TV event, SHARK WEEK 2014, coming to the Discovery(TM) Channel on Sunday, August 10 at 8 p.m. EST/PST. Cold Stone Creamery(®) (www.coldstonecreamery.com) and the Discovery Channel have come together, once again, to bring all of our fans an exciting summertime promotion to support the 27(th) annual SHARK WEEK. "SHARK WEEK has become such a phenomenon and we are happy to be a part of the excitement that builds each year around the Discovery Channel," said Kate Unger, senior vice president of marketing at Cold Stone Creamery. "Our tasty SHARK WEEK Creations pay homage to sharks and the fascinating creatures that they are. And the only thing better than watching SHARK WEEK is watching while eating Cold Stone treats." Cold Stone Creamery locations will celebrate SHARK WEEK with a limited-time only "SHARK WEEK Frenzy Creation(TM)" and "The Great Blue Cupcake" ice cream cupcakes. Both items are in stores now. Cracker Pier Crust and Gummy Sharks. Cold Stone Creamery has become a prominent ice cream shop that customer's recognize by the Ultimate Ice Cream Experience(TM) which includes mixing Made Fresh Daily(TM) ice cream on a frozen granite stone with their favorite mix-ins. Dive in and devour the delicious Cold Stone Creamery SHARK WEEK Creations for a Limited Time Only ending on August 19, 2014. The cupcakes are also available to order on-line at www.coldstonecakes.com. Cold Stone Creamery delivers the Ultimate Ice Cream Experience(TM) through a community of franchisees who are passionate about ice cream. The secret recipe for smooth and creamy ice cream is handcrafted fresh daily in each store, and then customized by combining a variety of mix-ins on a frozen granite stone. Headquartered in Scottsdale, Arizona, Cold Stone Creamery is a subsidiary of Kahala Brands((TM)), one of the fastest growing franchising companies in the world, with a portfolio of 15 quick-service restaurant brands. Cold Stone Creamery operates more than 1,500 locations in over 25 countries. Announced today, comedian and Doctor Who superfan Chris Hardwick will host Doctor Who: Live Pre-Show at 7:30pm ET and Doctor Who: After Who Live at 11:00pm ET following the premiere of Intruders on August 23. The pre-show and post-show will feature an array of guests in the studio including writer and actor Mark Gatiss along with exclusive behind-the-scenes footage. Doctor Who's feature-length season premiere episode, Deep Breath, is a pulse-racing adventure through Victorian London. Directed by Ben Wheatley and written by Steven Moffat, the episode stars Peter Capaldi as the Doctor, Jenna Coleman as his companion Clara Oswald, Neve McIntosh as Madame Vastra, Catrin Stewart as Jenny Flint and Dan Starkey as Strax. In the lead up to Doctor Who's new season, BBC AMERICA will premiere a series of specials including Doctor Who: The Ultimate Companion on Saturday, August 16, 9:00pm ET followed by The Real History of Science Fiction: Time at 10:00pm ET and Doctor Who: The Ultimate Time Lord on Monday, August 18, 10:00pm ET. The Doctor Who Takeover Week marathon will kick off Monday, August 18, 8:00am ET. Starting August 6, BBCAmerica.com will give fans a chance to vote for their favorite Doctor Who episodes - the top selections of this "Make Your Own Sunday" poll will run in a BBC AMERICA marathon on Sunday, August 24. On Saturday, August 23 at midnight, there will be 12 theatrical events in 12 cities at 12am/midnight to celebrate the launch of the new season. More information will be announced on August 5 at www.FathomEvents.com. On Monday, August 25, the celebration goes nationwide with two showings at 7:00pm and 9:30pm (local time). The event will be presented in more than 550 select movie theaters around the country through Fathom's Digital Broadcast Network. Tickets are now available for Doctor Who Season Premiere: Deep Breath at participating theater box offices and online at www.FathomEvents.com. Doctor Who is BBC AMERICA's highest-rated series, has set social media records and received numerous awards including last year's Institutional Peabody Award. The series has enjoyed success off-air with more than 10 million DVDs and 8 million action figures sold globally and is the BBC's top series on iTunes in the U.S. and UK. Doctor Who is a BBC Wales production for BBC One and distributed by BBC Worldwide. BBC AMERICA delivers U.S. audiences high-quality, innovative and intelligent programming. Established in 1998, it has been the launch pad for talent embraced by American mainstream pop culture, including Ricky Gervais, Gordon Ramsay, Graham Norton, and successful programming formats including ground-breaking non-scripted television like Top Gear and top-rated science-fiction like Doctor Who. Owned by BBC Worldwide, the commercial arm of the BBC, BBC AMERICA has attracted both critical acclaim and major awards including two Emmy® Awards, five Golden Globes® and eleven Peabody Awards. The channel attracts one of cable's most affluent and educated audiences and is available on cable and satellite TV in 80 million homes. It broadcasts in both standard and high-definition, with content available On Demand across all major digital platforms. Online, www.BBCAmerica.com is the place to go to dig deeper into pop culture with a British twist. Find out more by visiting www.Press.BBCAmerica.com/ or follow us on www.twitter.com/BBCAMERICA. Fathom Events is owned by a newly formed entity called AC JV, LLC. Fathom is the recognized leader in the alternative entertainment industry, offering a variety of one-of-a-kind entertainment events in movie theaters nationwide that include live, high-definition performances of the Metropolitan Opera, the performing arts, major sporting events, music concerts, comedy series, Broadway shows, original programming featuring entertainment's biggest stars, socially relevant documentaries with audience Q&A and much more. Additionally, Fathom events take audiences behind-the-scenes and offer unique extras - creating the ultimate entertainment experience for fans of all ages. Co-owned by the three largest movie theater circuits in the United States, AMC Entertainment Inc. (NYSE: AMC), Cinemark Holdings, Inc. (NYSE: CNK) and Regal Entertainment Group (NYSE: RGC), Fathom's live digital broadcast network ("DBN") is the largest cinema broadcast network in North America, bringing live events to more than 750 locations in 171 Designated Market Areas® (including all of the top 50). For more information, visit www.fathomevents.com. The Hollywood Reporter Releases 2014 List Of "Top 25 American Film Schools"
Amid fierce competition, Top 25 American Film Schools list ranks schools with "the latest tech, the most access to big names and the starriest alumni"
LOS ANGELES, July 31, 2014 /PRNewswire/ --The Hollywood Reporter has released its 2014 list of the Top 25 Film Schools, which ranks the nation's most distinguished teaching institutions for film production. USC's School of Cinematic Arts, NYU's Tisch School, UCLA, AFI, and California Institute of the Arts took the top five spots on the list. "Each year, the film industry takes note of The Hollywood Reporter's film school rankings, and the country's top schools vie to be included," said Janice Min, Co-President/Chief Creative Officer of the Entertainment Group of Guggenheim Media. "We're proud to again present a authoritative list, based upon the widest-ever survey of industry and education insiders." Based on an extensive survey of 2,300 industry professionals, Film Independent, American Cinematheque, and the schools themselves, the list takes into account tuition, student competitiveness, and which schools have "the latest tech, the most access to big names and the starriest alumni." The Hollywood Reporter also noted five up-and-coming schools to watch: Art Center College of Design, Art Institute of Chicago, Northern Film School, U.K., International School of Film and Television, Cuba (EICTV), and Mount St. Mary's College, Los Angeles. The Hollywood Reporter also published a list of the top 15 international film schools, with the U.K.'s National Film and Television School, Lodz Film School of Poland, and La Femis in Paris taking the top three spots. The Hollywood Reporter is the entertainment industry's flagship media brand. With in-depth reporting, analysis, unprecedented access, world-class photography and video, and feature exclusives, The Hollywood Reporter is the definitive source for breaking entertainment and business news. Founded in 1930 as a trade-only publication, The Hollywood Reporter reached an all-time high of 14.288 million individuals worldwide online at thr.com in March 2014, and over 224,000 readers in its weekly magazine, delivering news to an audience of industry power players and consumers deeply invested in entertainment content. The Hollywood Reporter's platforms include an award-winning weekly magazine, dynamic web and mobile sites, festival and awards season apps, tablet, iPad editions, social media, and branded events. Follow The Hollywood Reporter on Twitter @thr and on Facebook at facebook.com/HollywoodReporter. In 2014, The Hollywood Reporter won a Los Angeles Area Emmy Award for The Hollywood Reporter in Focus: The Wolf of Wall Street. SAN FRANCISCO, July 31, 2014 /PRNewswire/ -- Wikia, the social universe of fandom and the ultimate source for powerful and relevant pop culture expertise, in partnership with Roddenberry Entertainment, today announce "Warp 5.0: Fandom's Two-Year Trek Toward Sci-Fi's Golden Anniversary" as part of the online Star Trek community portal, TREK INITIATIVE. The two-year branded campaign celebrates the 50(th) anniversary of Star Trek, taking place in 2016. This unique project allows fans to be a part of the 50(th) anniversary via TREK INITIATIVE, the only official Wikia community dedicated to Star Trek. This portal, launched in 2013 by Wikia and Roddenberry Entertainment, features exclusive videos; fan-created content such as fan art, costumes and fan fiction; merchandise; and fan clubs. Launching at the Star Trek Vegas Convention this week, a signature element of the "Warp 5.0" campaign will be the world's first and only "census" of Star Trek fandom. Featuring an interview with Rod Roddenberry himself, this "census" will incorporate videos from fans around the world voicing their favorite Star Trek memories. Over the course of the next two years, this compilation will include videos from other live fan events as well as online submissions. "It's really fantastic to have the chance to pull in personal fan content around such an important milestone for my family," stated Eugene "Rod" Roddenberry, son of Star Trek mastermind Gene Roddenberry. "My father would be proud to be part of such a collaborative initiative celebrating the fandom of his legacy." Additionally, the campaign will incorporate various initiatives leading up to the 50(th) anniversary including Star Trek themed Qwizards, a collaborative quiz show testing Wikians' expert knowledge; a character bracket tournament featuring Star Trek's classic personalities; a fan film contest; showcases with celebrity talent; and more. "This is a huge opportunity for us to take Wikia's fandom one step further and really have our Star Trek superfans be part of such a memorable moment in time," stated Eric Moro, Wikia Director of Programming, Entertainment. "We are thrilled that Rod and his team continue to be such an important part of what we're doing - it really brings this to life for the fans." In April 2013, Roddenberry Entertainment and Wikia partnered to launch the ultimate, online Star Trek community portal. TREK INITIATIVE (www.trekinitiative.wikia.com) offers a gateway for the millions of Star Trek fans to gather, collaborate and communicate around everything Trek. It provides exclusive content and allows fans to share local community happenings with one another. The portal also features many Roddenberry assets, including a stirring commencement speech Gene Roddenberry gave in 1976, when the Star Trek series was reaching new heights of popularity and never-before-seen images from the set, from Gene Roddenberry's personal life, and more. Wikia, the social universe for fans, by fans, is the home for social fandom and the ultimate source for powerful and relevant pop culture, entertainment and gaming expertise. It is the definitive place for people to contribute to the assembly of original bodies of multi-media content around subjects they know and love. Using Wikia, anyone can form new communities around any subject or participate in over 350,000 existing communities by reading or contributing new content. With over 30 million pages of rich content, Wikia's communities are the most authoritative information about any topic on the Internet. Wikia's video game vertical (games.wikia.com) is a leading video-game focused information hub on the Web. Wikia's recently expanded entertainment verticals (movies.wikia.com, tv.wikia.com, books.wikia.com and music.wikia.com) collectively represent the fastest growing U.S. entertainment destination around the world. Lifestyle.wikia.com boasts over 75,000 communities chronicling fashion, food and technology. Roddenberry Entertainment is a science-fiction leader with a tradition of groundbreaking entertainment. Originally founded in 1967 by Gene Roddenberry, the company has since led a steady stable of science-fiction successes including Gene Roddenberry's Earth: Final Conflict, Gene Roddenberry's Andromeda and, most notably, Star Trek. Roddenberry Entertainment continues to produce entertainment for all audiences, employing a viewer-centric creative process and resulting in insightful explorations of humanity. The company's mission is to make good on its namesake's promise of superior science-fiction while utilizing new and varied vehicles of delivery. Building on its TV roots, this entertainment pioneer has also successfully ventured into graphic novels, documentaries, comic strips and 360° films, all the while continuing a long and unique tradition in quality merchandising. Roddenberry Entertainment has set itself apart by creating content that surpasses mere entertainment; it challenges its audiences to think, question and explore the world, as well as potential worlds beyond. ARLINGTON, Va., July 31, 2014 /PRNewswire/ -- Allbritton Communications Company ("ACC") announced today the tender results for its previously announced tender offer (the "Tender Offer") for any and all of its outstanding 8% Senior Notes due May 15, 2018 (the "Notes"). As of 5:00 p.m., New York City time, on July 30, 2014, Notes representing approximately 99.92% of the then-outstanding principal amount of Notes had been tendered. ACC has exercised its option to accept for payment and settle $454,640,000 of Notes. The Tender Offer was conducted in conjunction with the sale by the Allbritton family of the stock of Perpetual Corporation, ACC's parent corporation, to Sinclair Broadcast Group, which sale is expected to be completed today. In addition, ACC announced today that it has delivered notice to the holders of all of its remaining outstanding Notes of its intention to redeem any and all of the Notes pursuant to the Indenture governing the Notes. The redemption price for the Notes will be 104% of the outstanding principal amount of the Notes. ACC intends to accomplish a satisfaction and discharge of the Indenture by irrevocably depositing today with the trustee for the Notes funds in an amount sufficient to pay and discharge the entire indebtedness on the Notes. This press release is not an offer to sell any securities and it is not soliciting an offer to buy any securities. ACC has neither obtained any commitments to purchase, nor entered into any agreements, to sell any securities. ACC is an Arlington, Virginia-based communications company that owns and operates through subsidiaries and affiliates, seven ABC Network stations serving approximately 5% of total U.S. viewers. Also included is the 24-hour, local news service in Washington-Virginia-Maryland, NewsChannel 8. Owned by the Allbritton family since 1976, ACC has been in the forefront of industry change including cable news, digital conversion and multiplatform programming. Certain statements contained in this news release constitute "forward-looking statements." These forward-looking statements represent ACC's expectations or beliefs concerning future events, and it is possible that the results described in this press release will not be achieved. These forward-looking statements are subject to risks, uncertainties and other factors, many of which are outside of ACC's control, that could cause actual results to differ materially from the results discussed in the forward-looking statements. Any forward-looking statement speaks only as of the date on which such statement is made, and, except as required by law, ACC does not undertake any obligation to update or revise any forward-looking statement, whether as a result of new information, future events or otherwise. New factors emerge from time to time and it is not possible for management to predict all such factors. NEW YORK, July 31, 2014 /PRNewswire/ -- SiriusXM announced today that it will launch Nice Hair with The Chainsmokers, a new exclusive show hosted by DJ/production duo The Chainsmokers on Electric Area. In less than a year, The Chainsmokers--Andrew Taggart and Alex Pall--have risen to the top of electronic dance music. Their breakout single "#SELFIE" reached platinum status as well as #1 on Billboard's Hot Dance/Electronic Songs Chart. An online phenomenon with over 180 million views and counting, it also landed at #6 on YouTube's "Top Music Videos of 2014". They have been nominated for a Teen Choice Award and gained massive support for DJMag's "Top 100 DJs". Starting Monday, August 18, they will have their very own SiriusXM show. Nice Hair with The Chainsmokers will feature The Chainsmokers presenting world premieres of new music, DJ mixes and interviews with other emerging artists. The show will be fueled by the unpredictable personalities and wild antics of Taggart and Pall. Each show will feature the duo sharing behind the scenes stories about touring and unfiltered anecdotes about international stardom. The weekly show will launch on Monday, August 18 at 10:00 pm ET via satellite on Electric Area channel 52 and through the SiriusXM Internet Radio App on smartphones and other connected devices, as well as online at siriusxm.com. "We couldn't be more excited to have our first radio show ever on SiriusXM," The Chainsmokers commented. "We have always been quite opinionated when it comes to pretty much everything in life, so to have a channel to express ourselves and share music we think needs to be heard, is something we are very excited about. With that in mind, are they crazy giving us our own show!" "We make it a priority to constantly be on the cutting edge of EDM, and we are always looking for creative ways to work with artists and producers to create programming we know EDM fans will love to have access to. This new show hosted by The Chainsmokers is a unique addition to our EDM lineup," said Scott Greenstein, President and Chief Content Officer, SiriusXM. Electric Area plays today's biggest dance hits and remixes. Listeners will hear Tiesto, Afrojack, Armin van Buuren, Sander van Doorn, Avicii/Tim Berg, Above & Beyond, Eric Prydz, Swedish House Mafia, deadmau5. LOS ANGELES, July 31, 2014 /PRNewswire/ -- Guitar Center is proud to announce Slash Featuring Myles Kennedy and The Conspirators Live from the Sunset Strip presented by Gibson and Epiphone. The iconic guitarist is set to take over thee of Hollywood's most legendary venues, including The Troubadour, The Whisky and The Roxy in celebration of Guitar Center's 50(th) Anniversary. The shows will feature songs spanning Slash's storied career including material from his upcoming album, World on Fire, set to be released Sept. 16, 2014. Tickets for all three shows go on-sale August 1(st) at SlashOnline.com. Additionally, fans can visit guitarcenter.com/slash to enter for their chance to win a VIP trip for two to see Slash Featuring Myles Kennedy and The Conspirators live at The Roxy and take home an Epiphone Les Paul signed by the legendary guitarist. For fans unable to make it to Hollywood, Guitar Center will present Slash Featuring Myles Kennedy and The Conspirators Live from The Roxy, in a DIRECTV original 90-minute concert special filmed in stunning 4k and 5.1 surround sound. The special will premiere exclusively on DIRECTV's Audience Network (channel 239) Nov 9(th) at 8 p.m.
"I've always admired Guitar Center's commitment to artists," says Slash. "They're constantly creating new avenues for musicians to get their music out to fans and inspiring people to pick up an instrument and play. "They've also been supportive of my career since the very beginning here on the Sunset Strip. I am happy to be a part of their 50(th) celebration." "Guitar Center and Slash have enjoyed a relationship that spans 3 decades, so it goes without saying that we're excited to help him launch his new record," says Dustin Hinz, Vice President of Brand Experience and Entertainment Marketing. "Slash is a true icon that has influenced musicians his entire career and there's nothing more important to Guitar Center than to enable artists as legendary as Slash to continue inspiring future generations of musicians. His passion and dedication to the craft make him the quintessential artist to celebrate Guitar Center's 50(th) Anniversary." SLASH has amassed album sales of over 100 million copies, garnered a GRAMMY Award and seven GRAMMY nominations and was inducted into the Rock N Roll Hall of Fame.Time magazine named SLASH #2, behind Jimi Hendrix, on its "The Ten Best Electric Guitar Players of All-Time" list. SLASH helped create signature sounds like the guitar riff on #1 hits for Guns N Roses"Sweet Child o' Mine" and "Welcome To The Jungle." After leaving the band, SLASH went on to critical acclaim with SLASH's Snakepit and global success with the supergroup Velvet Revolver. SLASH's self-titled biography critically well-received, climbed the bestseller list in both the U.S. and U.K.hitting #8 on the NY Times Bestsellers List. SLASH landed on the top of the charts with his first solo album, Slash (2010) which featured Ozzy Osbourne, Fergie and more. SLASH and his band featuring Myles Kennedy and The Conspirators released the critically acclaimed Apocalyptic Love (2012) which stormed the Billboard Top 200 Albums Chart at #4 as the top rock debut and produced his first-ever #1 rock radio solo hits: "You're A Lie" and "Standing In The Sun. "SLASH released Nothing Left To Fear (2013) the first-ever motion picture he co-produced from Slasher Films, his film/TV production company. SLASH and his band will release their new album WORLD ON FIRESeptember 16, 2014. www.slashonline.com. DIRECTV (NASDAQ: DTV) is one of the world's leading providers of digital television entertainment services delivering a premium video experience through state-of-the-art technology, unmatched programming and industry leading customer service to more than 37 million customers in the U.S. and Latin America. In the U.S., DIRECTV offers its over 20 million customers access to more than 195 HD channels and Dolby-Digital® 5.1 theater-quality sound, access to exclusive sports programming such as NFL SUNDAY TICKET(TM), Emmy-award winning technology and higher customer satisfaction than the leading cable companies for 13 years running. DIRECTV Latin America, through its subsidiaries and affiliated companies in Brazil, Mexico, Argentina, Venezuela, Colombia, and other Latin American countries, leads the pay TV category in technology, programming and service, delivering an unrivaled digital television experience to more than 17 million customers. DIRECTV sports and entertainment properties include two Regional Sports Networks (Rocky Mountain and Pittsburgh), and minority ownership interests in Root Sports Northwest and Game Show Network. For the most up-to-date information on DIRECTV, please visit www.directv.com. Guitar Center is the world's largest retailer of guitars, amplifiers, drums, keyboards, recording, live sound, DJ and lighting equipment, with more than 260 stores across the U.S. 2014 Marks the milestone 50th anniversary of the Guitar Center Brand as we continue to help people make music from coast to coast. In addition, the Music & Arts division operates more than 120 stores specializing in band instruments for sale and rental, serving teachers, band directors, college professors and students since 1952. With an unrivaled in-store experience and passionate commitment to making gear easy-to-buy, Guitar Center is all about enabling musicians and non-musicians alike to experience the almost indescribable joy that comes from playing an instrument. All we sell is the greatest feeling on earth. For more information about Guitar Center, please visit www.guitarcenter.com. LOS ANGELES, July 31, 2014 /PRNewswire/ -- Cross-media company Screenz, announces the procurement of $5M investment from Marker LLC to expand research and development, accelerating the growth of technological advances in media entertainment. Screenz CEO Eli Uzan says, "The evolving media landscape provides partnership opportunities with major production companies and broadcasters, making traditional TV and second screen experiences inseparable. We are delighted that Marker LLC, a leading U.S. VC, is joining us to ensure Screenz continues to change how the world views and interacts with television." Screenz and Keshet International's Rising Star is the most social television series to date with 129,071 tweets at the series premiere and was the No. 1 downloaded iOS app. The ABC premiere outperformed NBC's America's Got Talent season premiere by 116% (59,734 tweets) and exceeded America's Got Talent social media interactions by 290% (33,106 tweets). Rising Star scored the highest rating for an ABC summer series debut in two years. Sold into more than 25 territories, this format uses an extensive suite of products featured on Screenz's Real-Time Platform. The cloud-based software solution developed by Screenz permits over 100 million interactions per minute while viewers engage with shows through second screen formats including: talent, trivia apps, real-time prediction, and social media extensions. Broadcasters and producers achieve live audience engagement while simultaneously capturing viewer data, extending their brands beyond the confines of TV, generating new advertising revenue opportunities, and taking TV into the Big Data marketplace. "Screenz is a leader in the emerging interactive television sector and helps navigate the future of the industry," says Marker LLC Partner, Rick Scanlon. "The company has created and flawlessly managed real-time interactive experiences on a large scale with globally renowned entertainment companies. Marker is thrilled to partner with Screenz and support its rapid growth." Screenz recently joined forces with Google extending the reach of its real-time technology. Screenz maintains a platform of innovative formats that will be revealed through leading technology and entertainment industry partnerships worldwide. Founded in 2012 as part of The Box group, Screenz is an international cross-media, next-generation entertainment company working with the television industry to co-create 360 interactive formats and digital assets. The Screenz team is comprised of entertainment professionals and technology experts, with offices worldwide including Tel-Aviv, Los Angeles, and London. STATE COLLEGE, Pa., July 31, 2014 /PRNewswire/ -- AccuWeather, Inc., the global leader in digital weather information, today announced it has launched a free AccuWeather service for users of Facebook's new Internet.org app. The app from Facebook was first launched on July 31, 2014 in The Republic of Zambia in Southern Africa with more locations to follow, and the goal of making the Internet more accessible and affordable to more people worldwide. The AccuWeather.com app for Internet.org provides weather forecasts with Superior Accuracy(TM) in more than 100 languages and dialects for nearly 3 million locations worldwide. Myriad forecast types are available, including severe weather notices, hourly, and 45-day extended weather forecasts. The free app from AccuWeather.com also includes radar where available and satellite maps, broadcast-quality weather videos and news, and hurricane and tropical storm information. "We are big believers in Facebook's Internet.org effort and are thrilled to be their partner in bringing AccuWeather's free, reliable, and lifesaving weather information to people who may not have been able to access the Internet before Internet.org," said Steven Smith, Chief Digital Officer of AccuWeather, Inc. "The initiative supports AccuWeather's ongoing dedication to providing important weather news and information to people everywhere that not only helps them make their short- and long-term plans, but also alerts them to severe weather and helps them to prepare." Facebook's Internet.org app makes the Internet more accessible through a set of free basic services - enabling people to browse useful content and websites without incurring data charges. The service makes the benefits of the Internet more accessible and affordable to more people around the world. The Facebook Internet.org app is now available to Airtel subscribers in Zambia. Airtel customers can access the service through the Play Store, www.internet.org, or within the Facebook for Android app. The service works on both smartphones and feature phones. Every day over a billion people worldwide rely on AccuWeather to help them plan their lives, protect their businesses, and get more from their day. AccuWeather provides hourly and Minute by Minute(TM) forecasts with Superior Accuracy(TM) for nearly 3 million locations worldwide, with customized content and engaging video presentations available on smart phones, tablets, free wired and mobile internet sites, connected TVs, and Internet appliances, as well as via radio, television, and newspapers. Founded in 1962 by Dr. Joel N. Myers - a Fellow of the American Meteorological Society who was recognized as one of the top entrepreneurs in American history by Entrepreneur Magazine's Encyclopedia of Entrepreneurs - AccuWeather also delivers a wide range of highly-customized enterprise solutions to media, business, government, and institutions, as well as news, weather content, and video for more than 180,000 third-party websites. AccuWeather's CEO, Barry Lee Myers, is a recognized expert in global weather information issues and one of the world most recognized advocates for cooperative relationships between government weather agencies and the weather industry. SANTA MONICA, Calif., July 31, 2014 /PRNewswire/ -- Lionsgate (NYSE: LGF), a premier next generation global content leader, announced today that multiplatinum GRAMMY(®) Award-winning recording star Lorde will curate the soundtrack album for the upcoming third installment of the global blockbuster The Hunger Games franchise, The Hunger Games: Mockingjay - Part 1. In addition to hand-picking the artists for The Mockingjay - Part 1 soundtrack, Lorde will provide the first single for the highly anticipated film and album. The soundtrack will be available via Republic Records this fall. The 17-year-old New Zealand native -who will embark on her third national North American tour this fall- exploded onto the scene with her Number One global hit 'Royals,' and has taken the music world by storm since the release of her critically acclaimed platinum debut album "PURE HEROINE" [LAVA/Republic Records]. Her quadruple platinum selling single 'Royals' helped earn two Billboard Music Awards for 'Best New Artist' and 'Best Rock Song,' and two GRAMMY® Awards for 'Song of the Year' and 'Best Pop Solo Performance.' She currently holds the record for 'Longest #1 on the Billboard Hot 100 by a Female Artist in 2013' and longest standing #1 for any female artist in the Billboard Alternative Chart history. The Hunger Games: Mockingjay - Part 1, directed by Francis Lawrence and starring Academy Award winner Jennifer Lawrence, Josh Hutcherson, Liam Hemsworth and Woody Harrelson, is the latest installment in Lionsgate's global box office phenomenon based on Suzanne Collins' bestselling "Hunger Games" trilogy and will be released in theaters worldwide on November 21, 2014. "I sat down with Lorde on the set of 'Mockingjay' this spring and I was immediately struck by how she so innately understood what we, as both fans and filmmakers, were trying to accomplish with the film. Her immense talent and keen understanding of Mockingjay's characters and themes not only have enabled her to create a song of her own that completely captures the film's essence, but her insight and passion for our project make her the perfect creative force to assemble the other songs on our soundtrack. I can't wait to share what she's done with the fans -- it is truly remarkable," said Francis Lawrence. Lorde's unique position as both a songwriter/performer and the curator of the Mockingjay - Part 1 soundtrack album came about via her unique relationship with her music publisher, SONGS Music Publishing who was a key architect of the deal. SONGS Music Publishing is the world's leading contemporary independent music publishing company. Its roster of 350 contemporary songwriters includes such acclaimed artists as Lorde, DJ Mustard, The Weeknd, Diplo and Nelly. Regarded as the songwriter's publisher, SONGS creates unique opportunities for its writers via innovative deals with content buyers and a deep commitment to both A&R and Creative Licensing. With its headquarters in New York City, SONGS also has offices in Los Angeles, London and Nashville. A division of Universal Music Group, the world's leading music company, Republic is home to an all-star roster of multi-platinum, award-winning legends and superstar artists such as Amy Winehouse, Ariana Grande, Black Sabbath, Colbie Caillat, Enrique Iglesias, Florence + the Machine, Godsmack, Gotye, James Blake, John Mellencamp, Of Monsters and Men, Owl City, Weezer, among many others. It is comprised of innovative imprints and digital business ventures including American Recordings (The Avett Brothers), Brushfire (Jack Johnson, G. Love), Cash Money (Lil Wayne, Drake, Nicki Minaj), John Varvatos Records, Lava Records (Jessie J, Lorde), Monkeywrench (Pearl Jam), Casablanca Records (Tïesto, Martin Garrix), NBC's The Voice (Cassadee Pope, Danielle Bradbery), XO (The Weeknd), among others. In addition, Republic maintains a long-standing strategic alliance with country powerhouse Big Machine Label Group which is comprised of Big Machine Records (Rascal Flatts, Taylor Swift, Tim McGraw), Dot Records, and Republic Nashville (The Band Perry, Florida Georgia Line, The Eli Young Band). LAVA Records was formed in 1995 where the roster boasted seminal multi-platinum, award-winning luminaries such as Kid Rock, Matchbox Twenty, Uncle Kracker, Sugar Ray, Trans-Siberian Orchestra, and more. Cumulatively, these artists sold in excess of 100 million records around the world during the eight years of the label's initial existence. From 2003 until 2008, current CEO and President Jason Flom departed the label to serve as Chairman & CEO of Capitol Music Group, where he oversaw releases for legends such as Lenny Kravitz and the Rolling Stones and also signed and ignited the launch of breakthrough superstar Katy Perry. In 2009 LAVA was revived via a strategic alliance with Republic Records for the label's distribution. The current phase of LAVA has led to breaking international Grammy Award winning artists Lorde and Jessie J as record-breaking musical icons. Other acts on the current roster include Black Veil Brides, Trans-Siberian Orchestra and more. NEW YORK, July 31, 2014 /PRNewswire/ -- Women's Health --the fastest-growing international women's magazine with a global audience of 35 million -- and FEED, the social business founded by philanthropist and social entrepreneur Lauren Bush Lauren, are partnering for the 3(rd) annual RUN10 FEED10 10K race series motivating consumers nationwide to help fight domestic hunger. Women's Health is expanding the program this year introducing two new digital platforms, as well as adding new cities to its roster with first time presenting sponsor Lincoln MKC. To date, RUN10 FEED10 has raised over 2.5 million meals to support the cause and is aiming to double that in 2014. "The concept is simple: run a 10K and provide 10 meals for those struggling with hunger in your community," says Laura Frerer-Schmidt, VP/Publisher of Women's Health. "The money from the registration and fundraising efforts will go to support the nearest metropolitan area food bank. And now, with our new digital initiatives, we've made it easier for everyone to get involved." Kicking off the event series in New York City on September 21, thousands of participants will run down the West Side Highway for the timed 10K race. The presenting sponsor, Lincoln MKC, will provide the pace car at each race. RUN10 FEED10 will also host timed races at Chicago's Diversey Harbor (10/19) and across the famed Golden Gate Bridge in San Francisco (10/26). Each will include post-race wellness festivals featuring yoga sessions, nutrition and beauty consultations and great giveaways from sponsors including FEED, Lincoln, Panasonic Beauty, Seiko, Chocolate Milk, and GEICO. "RUN10 FEED10 offers people the opportunity to challenge their bodies, while feeding their souls. As a runner, there is nothing more inspiring than knowing your participation provides 10 meals to families in your local community," says FEED CEO and Founder, Lauren Bush Lauren. "It has been incredible to watch the momentum build each year as we continue to add new cities and more runners. I am hopeful we will be able to provide a record number of meals to American families this year, as we run together to fight hunger." Expanding its reach, Women's Health is adding more cities to participate in its "Fun Runs" including Minneapolis, MN (Hosted by Next Fitness Star winner Stacie Clark), Denver, CO, Houston, TX, Los Angeles, CA, Phoenix, AZ, Atlanta, GA, Boston, MA and Washington D.C. If runners do not live in one of the Women's Health host cities, they can still participate by registering on RUN10FEED10.com and using the RUN10 FEED10 training app, created by WalkJogRun, to plot their own course and run their own 10K anytime. If a school, community organization or a large group would like to start a formal Fun Run, they can register as a group and Women's Health will provide tools including a marketing plan and downloadable promotional materials. All who register automatically provide 10 meals to children and families in America and will receive a limited-edition FEED bag. Women's Health is also launching a new digital component for RUN10 FEED10 by partnering with PlanG, the intuitive platform connecting consumers with non-profits to make charitable giving easy. PlanG will add RUN10 FEED10 to its list of top-tier charities offering an easy way to raise funds. Women's Health is the first magazine to work with the philanthropic company, which has relationships with more than 250 major retailers that give a percentage of each consumer's individual purchases to RUN10 FEED10--such as Macy's, Target, CVS/pharmacy, Sephora, iTunes, Bloomingdale's, Walgreens, and many more. Women's Health readers download the shopping app, then simply shop online and donations earned with each purchase will go directly to The FEED Foundation on behalf of Women's Health's RUN10 FEED10. Click the following link: https://www.myplang.com/wh/; install the PlanG shopping app for your web browser and shop at favorite brands to collect your extra giving dollars. Women's Health is excited to partner with ABC's Good Morning America, the Emmy Award winning morning show, for its second year to bring RUN10 FEED10 to households nationwide and inspire viewers to run and support the cause. Chief Meteorologist Ginger Zee will be one of the special hosts at the New York City flagship event, kicking off the race and participating in the run. Tune in to GMA in September for more details on how you can get involved. Women's Health has produced a new 2014 PSA to raise awareness and encourage consumer participation with new talent including Shailene Woodley, Elizabeth Banks, Kristen Bell, Joel McHale and Kerry Washington. The PSA can be seen on daytime TV stations across the US, Taxi TV and at RUN10FEED10.com. Sign up for RUN10 FEED10 at www.RUN10FEED10.com. Included in your registration is your race entry, your donation of 10 meals, and a limited-edition FEED bag. If you fundraise for RUN10 FEED10, there's no minimum fundraising goal. Raise $5, $10, $100 or more! All money raised will help those in need. About Women's Health: Women's Health propels 22 million consumers into action, providing the motivation and the inspiration for them to make instant, positive changes in their lives.Launched in October 2005 and published 10 times a year by Rodale Inc., Women's Health has quickly grown into a multimedia brand that includes branded books, mobile applications, and renowned events. The magazine has received numerous industry accolades including the 2011 ASME National Magazine Award in the category of General Excellence in Fashion, Service, and Lifestyle and was also nominated for the ASME of General Excellence again in 2013; nominated in 2014 for its third ASME in the Active Interest category; included on Adweek's annual Hot List two times and was nominated for a third in 2013; and was named Advertising Age's 2009 Magazine of the Year and also listed among their 2013 A-List winners. With 28 editions in 51 countries, the magazine continues to be the fastest growing women's magazine in the world. Visit www.womenshealthmag.com for more. About FEED: After witnessing the effects of hunger firsthand when traveling as a WFP Honorary Spokesperson, Lauren Bush Lauren founded FEED Projects in 2007 with the mission of creating good products that help FEED the world. Every product sold has a measurable donation attached to it and, to date, the social business has been able to provide over 75 million school meals globally through the United Nations World Food Programme and Feeding America. FEED has also supported nutrition programs around the world, providing 3.5 million children with Vitamin A supplements through UNICEF. Over the past seven years, FEED has forged successful partnerships with companies such as Target, West Elm, Disney, Clarins, Whole Foods, Gap, DKNY, Links of London, Godiva and TOMS. FEED products are available online and at retail locations around the world. For more information, please visit www.FEEDprojects.com or follow FEED on Facebook (FEED Projects) and Twitter (@FEEDProjects). About The Lincoln Motor Company: The Lincoln Motor Company is the luxury automotive brand of Ford Motor Company, committed to creating compelling vehicles with an exceptional ownership experience to match. The Lincoln Motor Company is in the process of introducing four all-new vehicles through 2016. For more information about The Lincoln Motor Company, please visit media.lincoln.com or www.lincoln.com. Follow us on Facebook at facebook.com/Lincoln.